The Dodgers make room to chase Bryce Harper by sending Yasiel Puig and three more to the Reds. Vin Scully called him the Wild Horse. Any time Yasiel Puig hit the field or the basepaths in Los Angeles, Dodger Stadium knew the only thing predictable about the talented but maddeningly inconsistent outfielder was how unpredictable he often was. In six seasons as a Dodger, Puig was many things. Boring wasn’t one of them. It’s not that you can say he didn’t give advance notice. A young man who survived daily death threats from Fidel Castro’s regime, escaped on what amounted to a milk carton raft, stowed aboard a coyote boat across the Gulf of Mexico, slithered through Mexico with and without the notorious cartels, and walked into Texas to finish his defection, knows a few things about how precious is life is and how exponential is the preciousness of freedom. Love of life has been snuffed out of lesser creatures in circumstances far less grave. Landing in major league baseball, Puig was like a small boy turned loose in the toy store and told not to even think about coming out unless his wagon was loaded to overflowing. Crash Davis in Bull Durham told a meeting on the mound, “This game’s fun, OK?” Puig has played the game as if Davis’s admonishment was Article VIII of the Constitution. He had only to learn how to distinguish between incandescent fun and immaturity without wrecking what made him unique in the first place. At one point it took an exile to the minors to deliver the point. Sometimes it really did seem as if nobody loved Puig but the people, at least those in Dodger Stadium or clinging to their televisions and radios around southern California. But he learned enough in that exile to return as a better teammate with a reasonable harness whose doffing should be saved for particular occasions, such as helping a fun clubhouse atmosphere and dugout enthusiasm. Now the Wild Horse, who can break a game wide open one minute while occasionally letting it escape temporarily the next, has the chance to teach Cincinnati more up close and personal what it means that the game’s supposed to be fun. On Friday, and with apologies to Whitey Herzog (who once said it of the late Joaquin Andujar, pitcher/human time bomb), the Dodgers traded their Puig-in-the-Box and a concurrent nine surprises a day—along with veteran outfielder Matt Kemp, pitcher Alex Wood, and reserve catcher Kyle Farmer—to the Reds, for struggling pitcher Homer Bailey and a pair of prospects, infielder Jeter Downs and pitcher Josiah Gray. In one grand move the Dodgers cleared a serious enough outfield logjam and bought themselves some breathing room regarding the luxury tax (oops–competitive balance tax, ho ho ho), which translates even more simply to room for a serious run at free agent rightfielder Bryce Harper, a player who has long enough believed in making baseball fun again and has no reserve about enunciating it. Things haven’t been all that much fun for the Reds since their last known postseason appearance. And if they weren’t even a topic when it came to the teams with the interest and the finances to hunt down Harper, getting Puig means there’s an excellent chance of things becoming a lot more lively in Great American Ballpark for at least one season. Puig, Kemp, and Wood can become free agents after the 2019 season. Kemp restored himself as a valuable player in 2018 when he returned to the Dodgers in a deal with the Braves that many thought was supposed to mean a brief stopover before moving on promptly. But he stayed in Los Angeles, made his third All-Star team, and had a first half that looked like a reasonable facsimile of the former self that looked like a superstar in the making but didn’t quite get there. Wood has been a better than useful pitcher for the Dodgers even if his 2018 wasn’t quite the level of his 2017. In the latter he led the National League in winning percentage while having his best season overall to date. Like Puig, Wood is a six-year veteran; Kemp has thirteen seasons on his jacket and may yet find Great American Ballpark’s hitting friendliness enough to his liking to play himself into one more two- or three-year payday. But the eyes of Cincinnati will remain on Puig, who could make for the plain most exuberant days of Reds baseball since the incendiary Rob Dibble, Norm Charlton, and Randy Myers forged the Nasty Boys bullpen who factored big in the Reds’ unlikely 1990 World Series sweep and left their own trail of mayhem in their wake before the group was broken up starting a season or two later. Maybe Puig, likewise a free agent after 2019 and looking at age 28, will bring enough fun, mayhem, and destruction of enemy pitching and baserunners (if he doesn’t throw them out, his missile launcher arm at least keeps them still enough) to convince the Reds to extend Puig a few more seasons. His first week in major league service sure didn’t hurt. Puig had a week that players would kill to have over a full season: he caught a high drive and doubled up a runner on the same play; he hit four home runs including a grand salami; he threw out Andrelton Simmons at third base on a throw for which Roberto Clemente would have given a champagne toast. His final days as a Dodger reversed Don Vito Corleone’s maxim about the relationship between misfortune and reward. On 14-15 September, against the Cardinals in St. Louis, Puig smashed five home runs—two the first day, three the second, overdue vengeance against the fans who’d trolled him a few years earlier, as the Dodgers fell out of the postseason early enough, with “Dodgers win? When Puigs fly!” Games like that helped send the Dodgers to this postseason. And almost helped them win the World Series. Puig’s three-run homer off Milwaukee closer Jeremy Jeffress in the top of the sixth put Game Seven of the National League Championship Series enough out of reach to send the Dodgers to the Series in the first place. 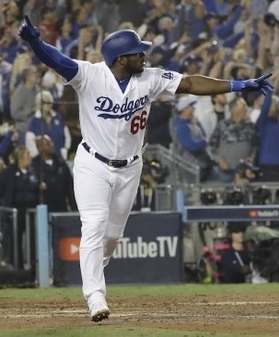 Puig flew, all right—a little bat flip here, a little crotch chop or two there as he ran the bases, having the time of his life, and not even his worst critics this side of Madison Bumgarner could really blame him. But in Game Four of the World Series, Puig’s great reward led to unforeseen misfortune. A day after the Game Three marathon ended in Max Muncy’s leadoff homer in the bottom of the eighteenth, Puig checked in at the plate—in the bottom of the sixth—after Cody Bellinger’s infield ground out turned into the game’s first run on a throwing error. With one swing Puig made it 4-0, this three-run homer landing even farther up the left center field bleachers than his Milwaukee blast did after bounding off the yellow line. Who knew that Red Sox pinch hitter Mitch Moreland would answer with a three-run bomb of his own in the top of the seventh? Or, that eventual Series MVP Steve Pearce would hit the game-tying bomb in the following inning, a prelude to his Game Five mayhem? Or, that the Red Sox would run the table for five in the top of the ninth, putting the Dodgers into a Series hole from which they never really saw light again? Great piece, @EasyAce ....as usual. IMO, one of the strongest things the Dodgers offer Harper besides the celebrity of Los Angelos compared to Washington, DC? The weather. Specifically, the Summer filled with ninety-plus degree days with stifling humidity. It's impossible to be 100% in that environment. Ask Stephen Strasburg. That SOB wilts unless it's 75 degrees and zero humidity. At least LA gets a freaking wind current. Even if the aforementioned doesn't completely affect Bryce Harper, the high number of injuries to both the Nationals and Reskins are offered as Exhibit A here. When was the last time a DC Region team fielded a team with its intended starting lineups? I'm not entirely sure, but it's entirely possible they wore this uniform . . .
LOL! Two things I notice right away. 1) That looks like a Spring Training inter-squad event...the catcher is wearing a Senators jersey. BP, I think it was. It does look that way until you realise it was 1971 (the Senators' last season in Washington). Now see if you can guess who the player with the bat who looks like he's on the cell phone is . . .
Glad about the Puig trade. He was a hella hitter to have to face, and i was tired of the brawls. He looks like Curt Flood. But it ain't. Except that . . . it is Curt Flood! * Flood, of course, sat out the 1970 season after refusing the deal to Philadelphia that prompted his challenge to the old reserve clause. * Commissioner Bowie Kuhn, of course, insisted that any deal had to include the reserve clause. So Short made his own deal with Flood on the condition both men kept their mouths shut about it publicly---he offered Flood $100,000 for the 1971 season without a signed contract, then promised that if they couldn't agree to terms on a 1971 deal, Short would release Flood unconditionally, making him a free agent. * Flood opened the 1971 season with the Senators. But on 27 April, at age 33 and struggling to find his old form after a year and a half away from baseball, Flood left the team and the rest of his salary on the table. (He'd collected maybe a quarter of it before he left.) He even left Short a note thanking him for the opportunity and for his confidence. Flood's note mentioned "very serious problems" he was having. They turned out to be both trouble with the photographic/painting business he still had in St. Louis and with what was turning into a bitter divorce. Flood went to Denmark for a short spell to sort things out as he awaited the upshot of his reserve clause challenge. Koufax and Drysdale showed what was possible when players negotiated together. Harrelson first showed the potential of a free market for players' services. Flood's reserve challenge may have failed at the Supreme Court but the owners' then liaison to the Major League Baseball Players Association, John Gaherin, warned them correctly that all the ruling did was buy them a little more time: "Gentlemen," he tried to tell Gussie Busch's attorney, "you can't get anybody, drunk or sober, to agree that once a fella goes to work for the A&P he has to work for the A&P the rest of his life." Ahead lay a series of players refusing to sign contracts but playing out their option seasons and getting yummy new contracts as the season went on. Ahead of that lay Finley reneging on a contracted-for insurance payment to Catfish Hunter, which got Hunter his free-agency and really showed players what an open market could bring. And---after salary arbitration came into play but a little too late, so far as Gaherin was concerned, to stave off the inevitable (he genuinely believed arbitration might have ended up saving the owners' hides)---ahead of that lay Andy Messersmith, pitching without a 1975 contract, and finally beating the reserve system. But along the way, Curt Flood made his brief stop with the Senators. He proved the least of the team's problems before they played their final game as Washington Senators at the end of that season. Page created in 1.267 seconds with 21 queries.